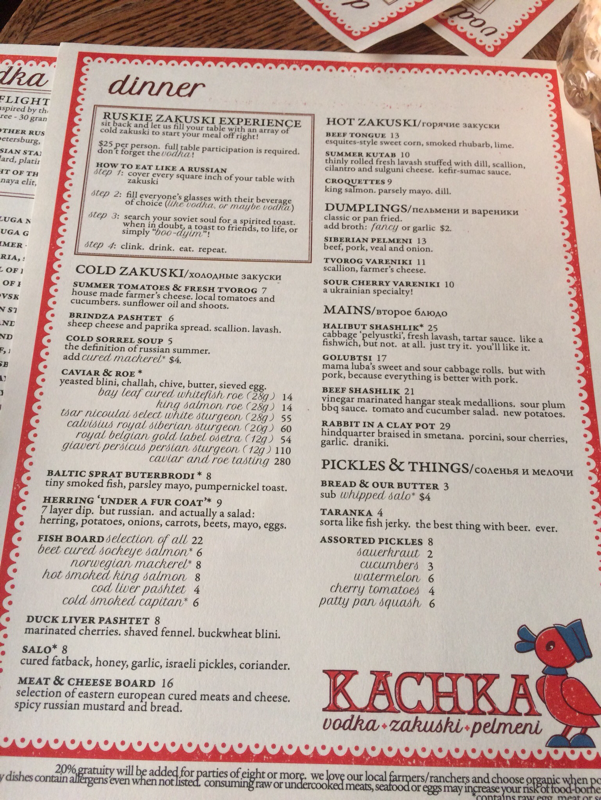 A short bus ride away, and only a couple blocks off the river on the east side, lies Kachka, where Sam assured me the food was wonderful and I could “eat the menu for under $60.” This was not COMPLETELY true, though the effect to which it was is worth mentioning later. Despite my Eastern European Jewish roots and the care of a Polish woman in my youth, my knowledge of Russian food is absurdly slim. 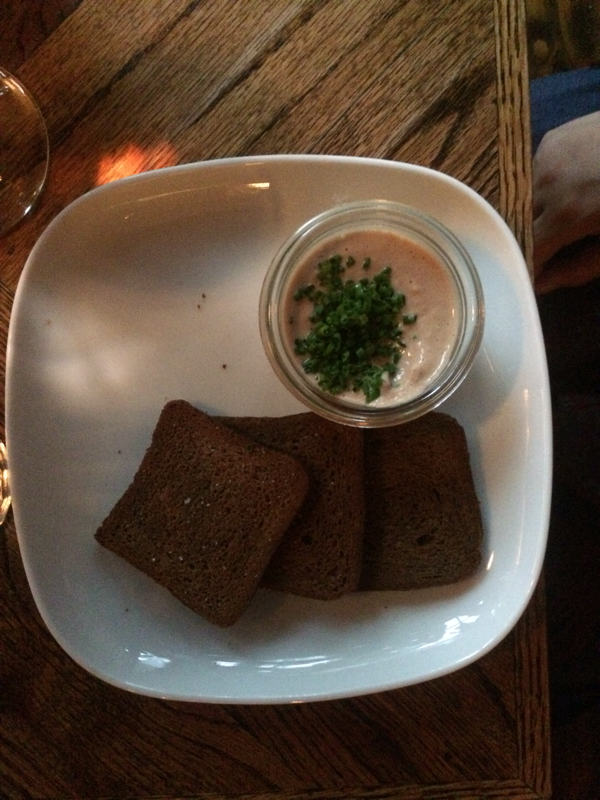 Following is a complete list of my prior knowledge of Russian cuisines, informed mainly by visits to “Red Square”- a Soviet-themed bar formerly in one of the casinos of Atlantic City, so I will freely admit my expectations were mixed-to-low. 1. Fish are involved. Likely smoked, sometimes cured. 3. Potatoes, cabbage, and other hardy vegetables. 4. Pork or game are the preferred non-piscine proteins. 5. VODKA, and the eating of food based around consuming it in vast quantities. 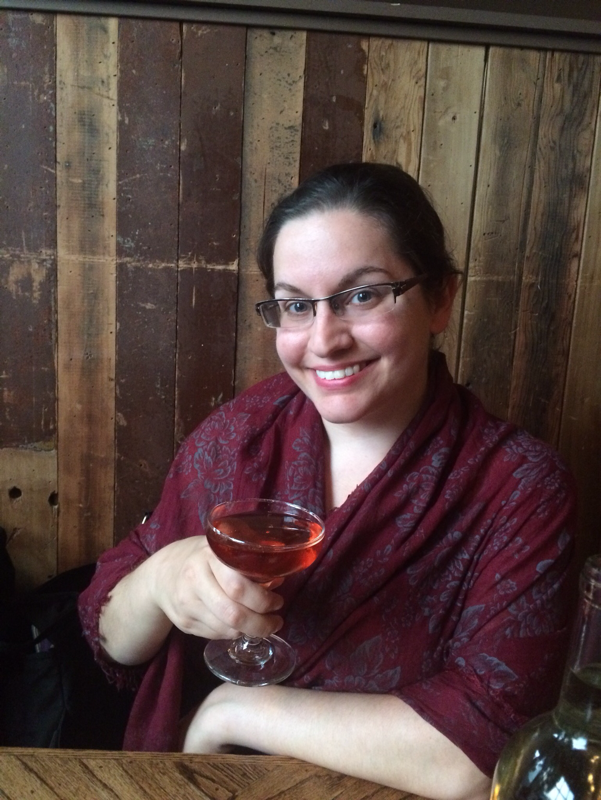 As with Cuban food at Pambiche, I was never so happy to be proven right AND wrong. Emily and I had the exact same impression as soon as we walked in- “Elegant rustica.” The restaurant gave in only slightly to the expected decor of its Russian theme. 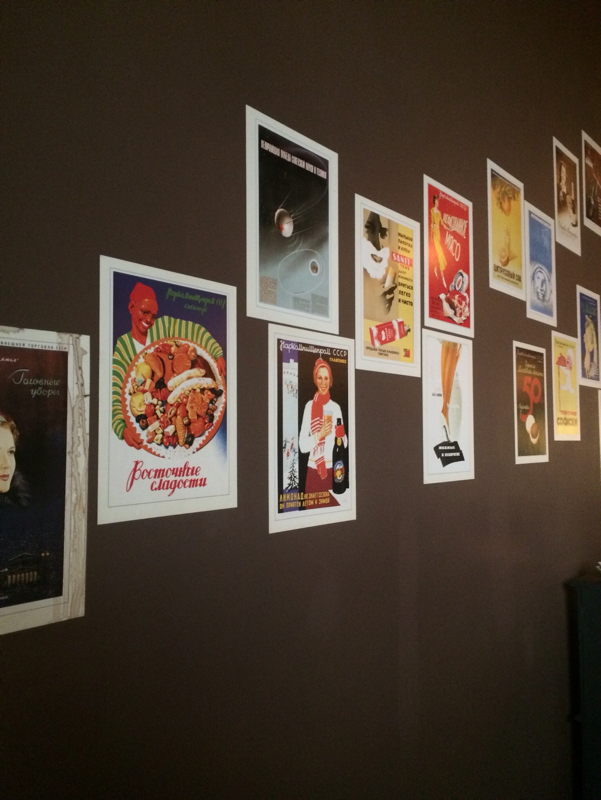 Soviet-esque small posters trailed up one wall, depicting smiling workers and food. To one side of the bar hung a small portrait of Lenin. Apart from that, however, the ambiance of the room was comfortable ease, even as crowded as it was. 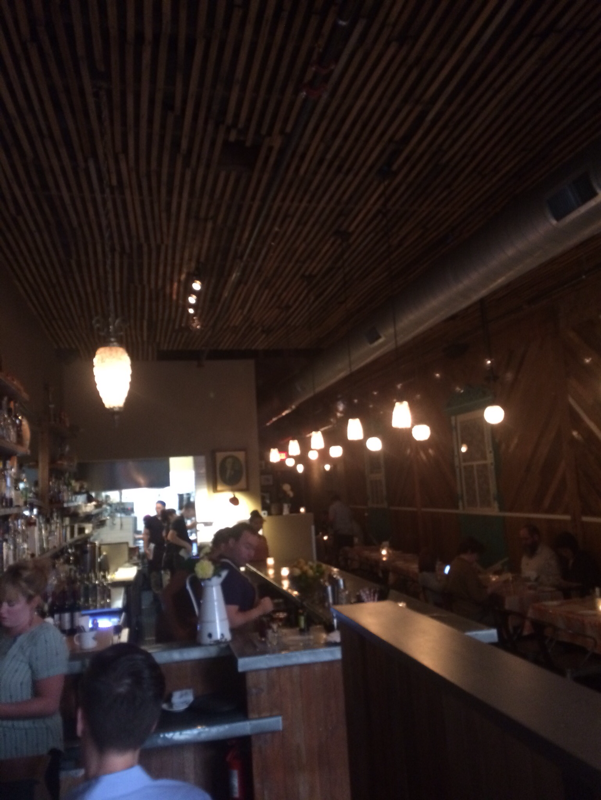 Arriving as walk-ins, we were informed that we could sit at the bar or in the lounge almost immediately. The “lounge” was a circular area far forward of the dining room, close to the front window. Once presented with the menus, Emily and I quickly saw where the expected kitsch from the walls went. The menus were littered with a tongue-in-cheek humor regarding the nature of each offering and what the diner might expect. Our eyes quickly zoomed in on the drinks menu. Kachka is known for not only an excellent vodka list, but for infusing/creating their own interesting liquors, for in-house use and retail sale. Yes, my wife is adorable. She really enjoyed the Countess Rostova. The “PDX” Vodka flight, from left to right: Rolling River, Portland Potato, and Dystopia. The shots arrived ice-cold, as it should be. I was torn for a moment- how quickly can I taste each one and give it its proper due, without allowing the others to lose their chill? Then I realized that the vodka was getting warm, and I should stop putzing around and drink. The first in the flight- Rolling River- was a grain based. 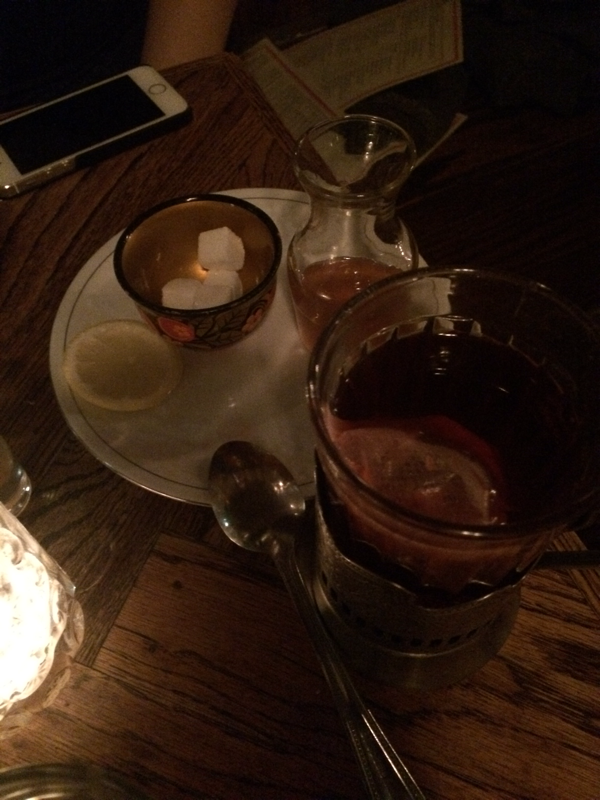 It was mellow, smooth, and slightly warming despite being frigid. The second, Portland Potato, was the exact opposite- it was potato-based and had an oddly firm, starchy quality to it. It was a little more coarse, but amazingly refreshing. 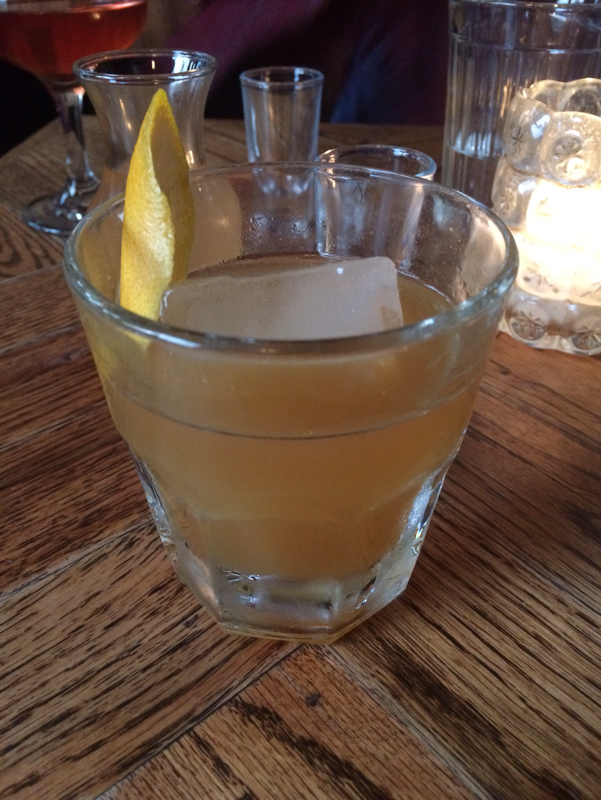 Last came Dystopia- a blend of grain and potato vodkas. 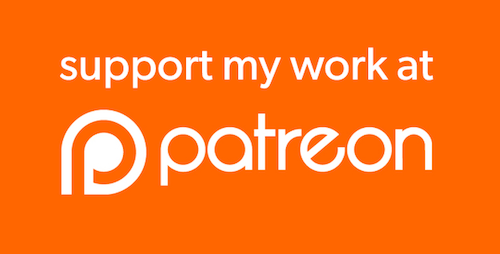 It…. well, it tasted very strongly of bananas. Not unwelcomely, and not like banana candy- but bananas none the less. All were very good, but alas- I remain NOT a vodka man. Towards the bottom of the list was a VERY curious offering- “Pickle Juice- nature’s hangover cure. 100g- $1.” I am quite familiar with the idea of a pickleback, but I was curious enough why the brine deserved its own place on the menu. 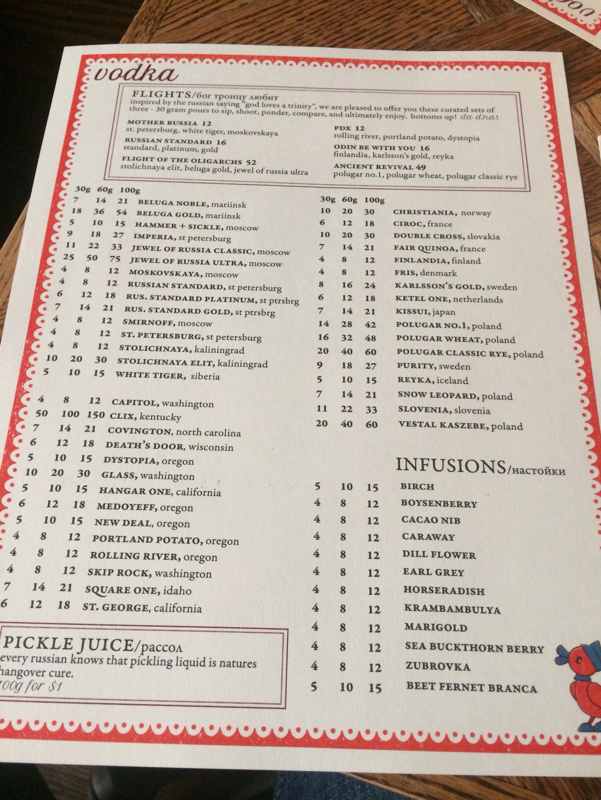 Kachka makes its own varied pickles, and switches out which brine gets poured for their pickleback regularly. Tonight, it was their watermelon pickle. Emily was… skeptical to say the least. First courses involved the toughest choices. 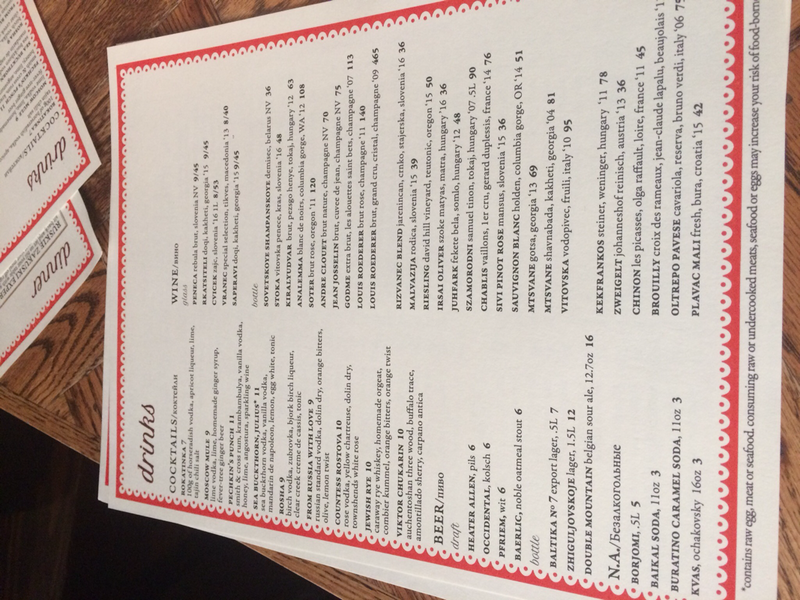 Fully two-thirds of the menu was given over to zakuskie- small plates of various cold and hot snacks meant to be consumed with copious amounts of- you guessed it- vodka. You could pick and choose from their selection, or for $25 a person and the full tables’ cooperation, you could get a chef’s selection from the cold menu. There being only two of us, we decided to just pick whatever seemed most delicious. 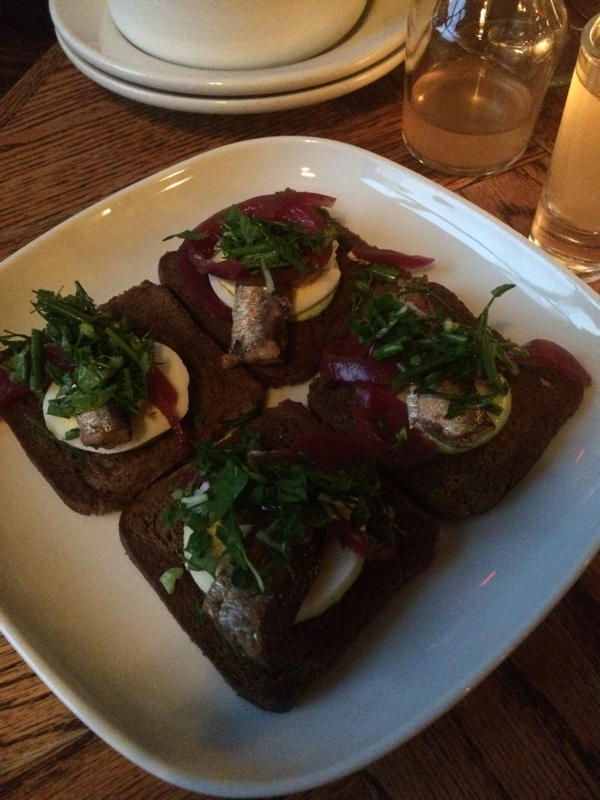 I chose their hot smoked king salmon with toasts, and Baltic Sprat Buterbrodi- a simple presentation of tiny fish on pumpernickel toast with a parsley mayo. Emily plumbed for their cod liver pashtet- a kind of runny mousse. The king salmon was rich and decadent, and Emily’s pashtet was light as air- almost something to be dipped rather than spread on the accompanying toast squares. Over all of it, however, stood the Buterbrodi. 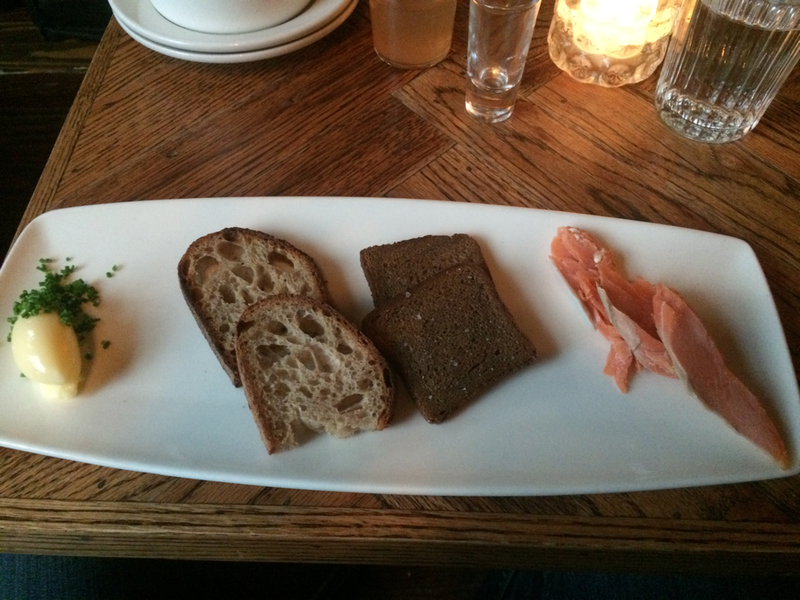 Every part of the simple dish- fish, mayo, and bread- stood out uniquely but united. The fish didn’t crowd out the mayo, and the toast did not vanish into the background- and of course, it all went wonderfully with vodka. Then the main courses arrived. 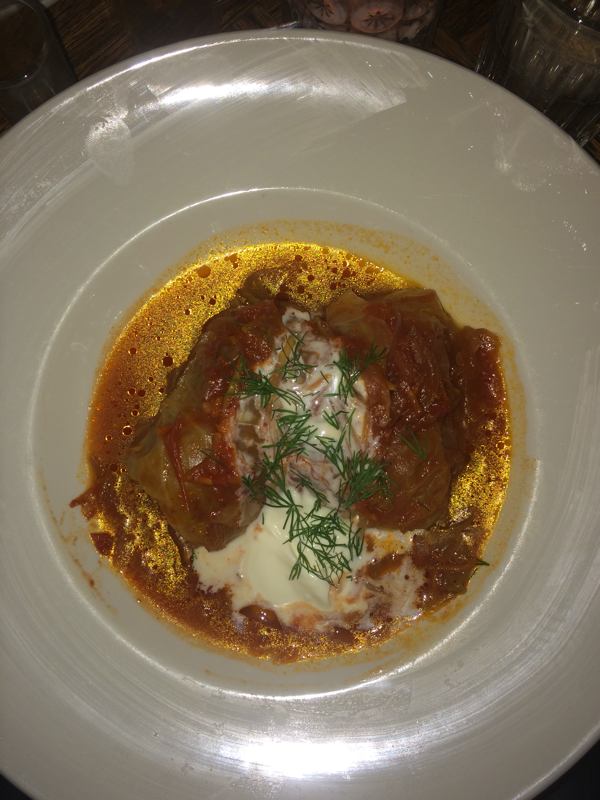 I had opted for Golubtsi- pork-filled sweet/sour cabbage rolls in a tomato sauce and a drizzle of sour cream. This was only somewhat familiar to me, as I had had stuffed cabbage leaves prepared by a family member before. 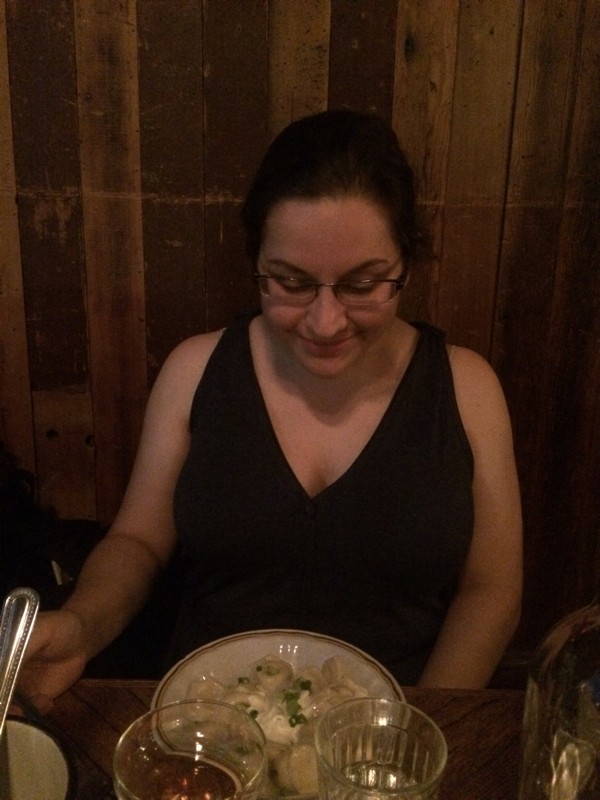 Emily similarly chose something vaguely familiar- Tvorog Vareniki, tiny pirogi-esque dumplings filled with scallion and cheese. I apologize for the quality of the pictures here. I was trying to be quick and careful because 1. I absolutely HATE being “that person” that lets their food get cold while they are taking pictures of it, and 2. I took one look and knew I needed to get these little tubes of delicious in my face as rapidly as possible. 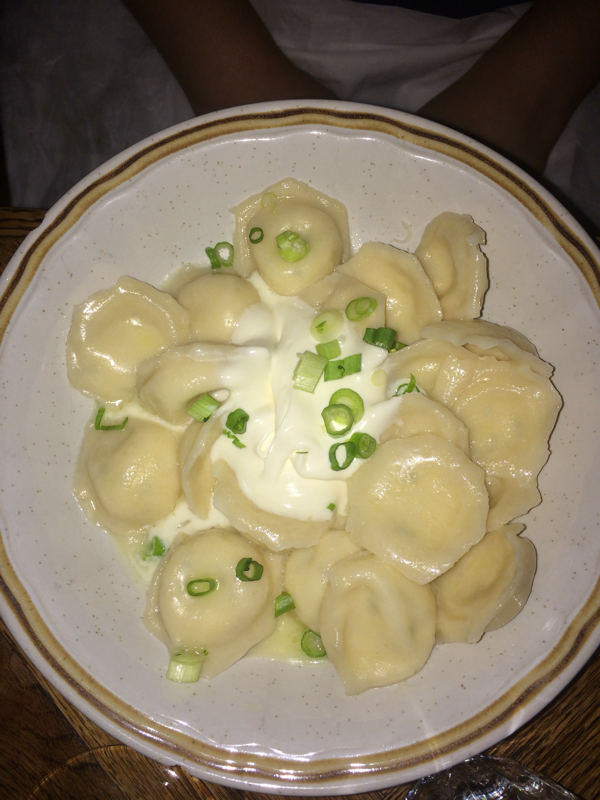 The vareniki were little pillows of cheesy loveliness, of a lighter texture and flavor than I would have expected. The golubtsi were similarly astounding. The smell of cooked cabbage (which I normally dislike) was utterly absent, replaced by the bright acidity of the tomato sauce and the richness of the solidly-packed pork. I had anticipated a punch and a steel weight in my stomach- I got a pat on the back and a belly rub. Tea arrived, and I will happily admit- yes. 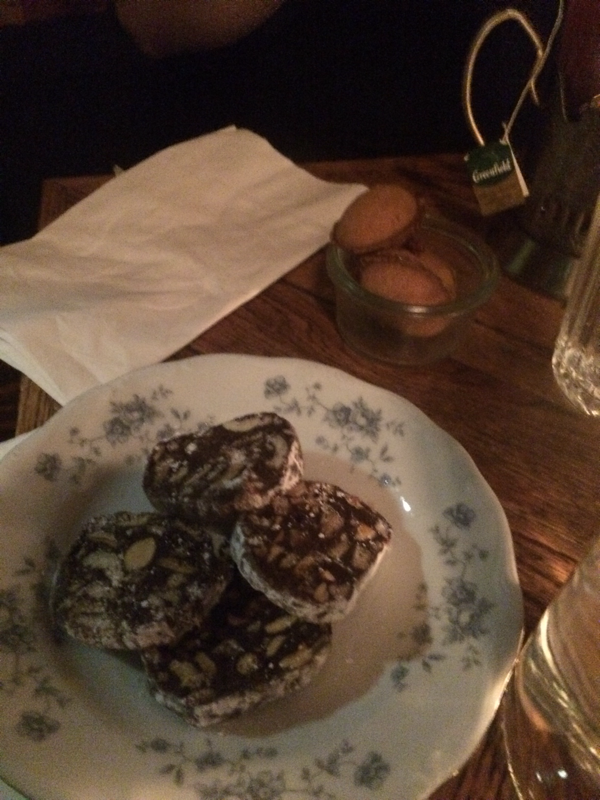 The little cookies at the end of such a fine dinner were ABSOLUTELY PERFECT. Oreshki- little caramel-filled nut-shaped cookies came in a small cup and offered tiny spikes of sweetness, while the Chocolate Kolbasa cookies came ice-cold and smacked of rich chocolate and toasted hazelnut. That’s how I know I have the best wife. She joins me for tasty fish, and reminds me when I need to be writing, and not drinking pickle juice. It’s an interesting life we have. HOW: Drop in, or check out their website at http://www.kachkapdx.com for how to get reservations or reserve their back room. WHY: Because you are in the mood for something different, but oddly familiar. You want to feel elegant, but relaxed at the same time, and kinda want to enjoy some good liquor with curious finger foods.